Visit us at the Homestead Craft Village and watch our live pottery demonstrations. Learn more about our classes. Browse our online galleries. 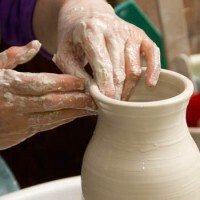 Would you like to learn to make pottery? Our classes will help you quickly master the basics. functional household items and more. See our gallery of beautiful, custom pottery. Managing potter, Jenni Fritzlan, has been making pottery for nearly twenty years later. She consistently produces high-end ceramics in a number of different styles. As an instructor for The Ploughshare Institute, Jenni teaches a variety of pottery classes throughout much of the year and oversees the staff of potters at The Potter’s House. Jenni has recently begun focusing her efforts on mastering an ancient Japanese style of pottery known as Raku and has also been experimenting with custom teapots for Cafe Homestead. For a more in-depth look at Jenni’s journey in pottery read this interview.